Finding a tick on your dog can leave you feeling disgusted and worried. Maybe the thought turns your stomach. Or maybe you're concerned about the risks ticks pose to both your pet and your family. But one thing's for sure—ticks are an indisputably a dreaded enemy. Besides the obvious “icky” factor, a tick bite can transmit diseases, cause anemia or infection, and can even cause a rare but serious condition in dogs called "tick paralysis." As a dog owner, know the basics of tick removal and prevention and educate yourself on the risks of disease. With proper knowledge, you can both protect your dog from the threat of ticks and know how to handle a bite should your dog receive one. Most tick bites can be detected by simply running your hand through your dog's fur, noting any lumps or bumps on the surface. Ticks often attach themselves in crevices or on areas with little to no hair. Pay special attention to the soft, warm area around the face, ears, and neck, and also check the limbs. On light colored dogs, it's easy to spot a brown or black abscess protruding from the skin. This, most definitely, is a feasting tick. On darker colored dogs, however, it may be necessary to inspect them further for attached ticks or any scabs or wounds left behind by the dining culprit. Not all ticks transmit disease. Many ticks carry no diseases at all, even though the threat of a bite should be taken seriously. Most tick-borne diseases, however, will take several hours to transmit to a host, so the sooner a tick is located and carefully removed, the lower the risk of disease. Symptoms of tick-borne diseases—like Lyme disease, Rocky Mountain spotted fever, and tick paralysis—first present with a fever and lethargy. Some diseases can also cause weakness, lameness, joint swelling, or anemia. If a mass infestation occurs, a tick's saliva can cause toxins to enter your dog's bloodstream, resulting in tick paralysis. In this instance, the gradual onset of a clumsy gait that develops into paralysis may occur. These signs typically begin to resolve soon after the ticks are removed. If you notice signs of illness in your dog, contact your veterinarian as soon as possible so that proper testing and necessary treatment can begin. And do note that symptoms of certain tick-borne diseases can take days, weeks, or even months to appear. Ticks are parasitic arthropods that feed on the blood of their hosts. Attracted to warmth and motion, they seek out mammals—including people, dogs, and cats—to attach to and bite. Most species of ticks go through four life stages: eggs, larvae, nymphs, and adults. And, in order to mature, a tick must feast on blood during all of its growth stages. Depending on the species, the lifespan of a tick can be several months to years, making them an ongoing threat to both pets and humans. Ticks hide out in tall grass or shrubs and wait for prospective hosts (this is called "questing"). When a host is found, the tick climbs aboard and attaches its mouthparts to the skin, beginning its meal of blood. The tick may continue to feed for several hours to days, and will not detach until its meal is complete. 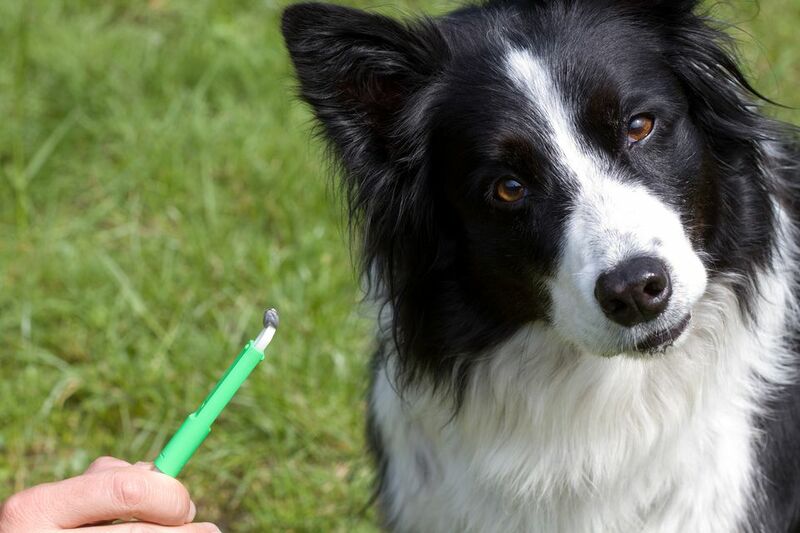 To remove a tick from your dog, first locate a clean pair of blunt-nosed tweezers. Next, pull the hair away from the surrounding bite region and place the tweezers as close to the dog's skin as possible, carefully clamping down on the tick. Pull straight out (no twisting) with gentle pressure until you feel the tick lessen its grip and you can pull it away from the skin. Try not to grip the tick too tight so that you puncture its body, potentially releasing blood and pathogens. And never try to burn it away with a lighted match, as doing so may cause the tick to release more saliva (and toxins) into your pet. Once the tick is off, place it in a sealed plastic bag or a jar of alcohol and call your vet for inspection. Finally, clean the wound with alcohol and place a small amount of topical antibiotic on the wound. Upon tick inspection, your veterinarian may recommend blood testing to look for tick-borne disease. If your dog spikes a fever, acts lethargic, or experiences any sign of lameness, a vet may administer antibiotics for several weeks proceeding the bite. With sudden Lyme onset, antibiotics should help your dog recover in two to five days. Dogs who suffer from kidney damage due to Lyme need further treatment with a longer course of antibiotics, and sometimes require hospitalization, nutritional support, and IV fluids. In this case, a full recovery depends on the severity of the damage. For tick paralysis, simply removing the ticks will usually resolve the symptoms in a matter of hours, as the neurotoxins in a tick's saliva are the underlying cause. In a few cases, supplemental oxygen may be supplied to dogs who are showing difficulty breathing due to anaphylaxis. Once the effects of the toxins subside, the dog should show a complete recovery. If you live in a region where ticks are found, check your dog every time you come in from the outdoors, especially after romps through wooded areas. You can also call a professional service to spray your yard for ticks. Look for a service that uses essential oil-based sprays that are safe for children, pets, and foliage. Dogs can also be treated with products like tick shampoos and collars. These products usually contain harsh chemicals, however, and are not recommended for use on puppies. Ask your vet to recommend the safest, most effective prevention product available and be sure to use it as directed.